Now you can understand why Rep. Martha McSally schedules private “town halls” before friendly constituencies (like her former employer Raytheon) and tele-town halls rather than public town halls where she gas to face constituents who show up and ask her “impertinent” questions that she does not want to answer. Let’s take a look at how McSally’s town hall in the usually friendly confines of Sahuarita and moderated by editor Dan Shearer from the Green Valley News went yesterday. 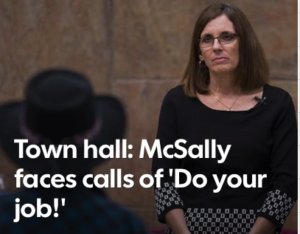 In a sometimes-raucous replay of town halls across the country, U.S. Rep. Martha McSally faced shouts, pleas and cat calls from a noisy share of her constituents Thursday. Many among the 250 people inside the afternoon event at the Good Shepherd United Church of Christ vented their simmering anger at President Donald Trump and called for her to rein in his agenda on issues such as health care, gun rights and immigration reform. Dozens or more people chanted “Do your job!” and pressed signs hostile to the administration against the doors outside the church. For about 90 occasionally tense minutes, there was little sign of the close partisan division within McSally’s district. Instead, it was dominated by Democrats and liberals who called on her to serve as a check on the president. I’m sorry, but how can this reporter know the voter registration of those in attendance? This is an editorial assumption by a reporter without supporting facts. There were just as likely unhappy Republicans in attendance as well. Throughout, McSally tried to present herself taking measured views on tough issues. “We have to have a smart immigration policy,” she said at one point, drawing groans from a crowd that saw too many of her answers as deliberately vague (a McSally trademark). At one point, McSally defended her vote disapproving of a rule by the Social Security Administration that would allow some people to have background checks without their knowledge. Critics saw this as overly friendly to gun-rights supporters. The last question of the event captured the tone of the night and McSally’s sometimes-elusive answers. Nine-year-old Mitchel Collins, asked why McSally thought Trump’s Education secretary, Betsy DeVos, was qualified for her post. McSally immediately asked the boy why he considered her unqualified. “Because she wants guns at schools,” he said, drawing cheers from some in the crowd. McSally eventually explained that the Senate confirmed DeVos. “I am not in the Senate. Thank God,” she said. You will note that she did not answer the Mitchel Collins’ question. Still, Thursday’s event carried some measure of political risk. Nationally, many Republicans have shunned town halls and limited other public appearances since Democratic-leaning protesters have been confronting conservative members of Congress with pointed questions and pleas for them to rein in the Trump administration. McSally said she had met personally with some of her more vocal critics. McSally’s district collectively voted for Democrat Hillary Clinton by nearly 5 percentage points last year. That has seemingly had little impact on McSally’s early voting this year. Entering this week’s recess, McSally had voted with Trump’s public positions every time in 14 House roll-call votes, as tracked by the website FiveThirtyEight. That was the same record as the other four GOP members of Arizona’s delegation. The state’s Democratic contingent has voted solidly against Trump’s positions so far. McSally, who recently committed to holding this live town hall after saying such gatherings were settings for “political ambush,” often gave long answers that seemed to anger the crowd and sidestep the questions posed by the audience or by the moderator, Editor Dan Shearer of the Green Valley News, which sponsored the event. Audience members inside Good Shepherd United Church of Christ at times shouted at McSally, demanding she answer their questions with a simple yes or no. McSally resisted, saying the questions were often complicated and required lengthy responses. Even more lined up along a nearby street, holding protest signs. The two-term congresswoman told reporters the town hall was a bit “rowdy at times” and noted that some of the activists who had organized a competing town hall in Tucson showed up at the Sahuarita event. During the 90-minute forum, McSally said she was against mass immigration deportations, believes climate change is real and vowed to protect Social Security and Medicare. Her statement opposing mass deportations brought a welcome response from the audience. But as she elaborated her stance to some other issues, audience members repeatedly interrupted her to voice their displeasure with her answers. In other issues, McSally attempted to explain her positions directly to the individual asking the questions. McSally told a teenager wearing a pink Planned Parenthood shirt that she was committed to making sure that community health centers would offer her reproductive care. Booed again when she called Obamacare “a disaster,” McSally attempted to explain how she wanted to replace it over time, but her lengthy three-step answer seemed to anger many in the audience. When 9-year-old Mitchel Collins, who goes to school in Sahuarita, asked at the end of the town hall why she thought Betsy DeVos was qualified to be the nation’s education secretary, McSally asked why he thought she was unqualified. Collins immediately answered, saying DeVos said she wanted guns in schools to protect against grizzly bears. It would take a few moments for McSally to respond, noting the Senate confirmed DeVos and the committees she sits on in the House are not education-related. Other answers simply were not well-received. When a mother asked McSally about the rollback of bathroom rights and how it would affect her transgender son, the congresswoman’s answer was quickly drowned out by loud jeering and booing. “It needs to be balanced to protect children like yours, but also other children,” McSally said. McSally briefly touched on gun control issues, touting her attempts to push forward “sensible solutions” but conceded there was more work to do. At the end of the town hall, Shearer asked McSally to commit to another town hall soon. “Of course, I am doing one tomorrow,” McSally said. Later, a McSally staffer noted the meeting she mentioned is closed to the public. Another town hall Thursday was held without McSally in attendance. That gathering, at St. Francis in the Foothills United Methodist Church, attracted about 400 constituents, including members of the Pantsuit Nation Tucson Chapter, Stronger Together Cochise County and Nasty Women and Bad Hombres of Tucson. Marion Chubon of McSally Take a Stand spoke first, expressing her disappointment with McSally’s decision to not attend the group’s event. McSally informed the group that she was not able to commit to attending, Chubon said. One day later, McSally announced she would attend the town hall in Sahuarita. Following one or two speeches [by scheduled speakers] on each issue, a member of McSally Take a Stand came to the podium and described McSally’s views on that particular issue and how she has previously voted. After the scheduled speakers, audience members were invited to speak, concluding their speeches with a question for the congresswoman. These speakers addressed an empty podium. About 250 people packed Good Shepherd United Church of Christ in Sahuarita for her first in-person town hall since her re-election in November. [The] attention drew media from across Arizona and the country to Sahuarita on Thursday, where many in the audience wore name tags with their ZIP codes to show they were constituents; a majority appeared to be from Tucson. Hundreds of others who couldn’t get in stood outside the door and could clearly be heard chanting and yelling throughout the 90-minute event. One estimate put the total crowd at about 800. McSally did not waste time diving into the questions, forgoing opening remarks to get to what the audience wanted to discuss, though her answers weren’t usually what they wanted to hear. She did seemingly try to weave around some questions, such as when she was asked about Education Secretary Betsy DeVos. The congresswoman spent a few minutes talking about her support for education and the cost of college before calls for an answer from the crowd led her to say that the Senate has the role to confirm nominees, not the House. 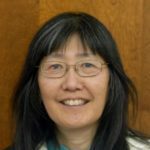 “We will see what comes out of her department; she’s been appointed,” she said. She also said she supports House, Senate and FBI investigations into possible connections between President Trump, Russia and the 2016 election. She said she would not call for an independent investigation yet. However, she also said that the repeal of the ACA would not be in one fell swoop, but she envisioned a transition of two, hopefully three, years to allow everyone “continuity and predictability” and a “soft landing.” She reiterated from her tele-town halls that the replacement would be done through changes from the secretary of Health and Human Services, budget realignments and some legislation. On the issue of defunding Planned Parenthood, her statement that similar services could be found at community health centers, which also receive Title X funding and she claimed were more abundant, was met with raucous disagreement by the audience. McSally acknowledged that she had never gone to a Planned Parenthood clinic but stuck by her assertion that Title X funds for women’s health services were still available through community health centers. “This is again about services, not the entity,” she said. When asked about Trump rolling back Title X protections for transgender youths, McSally said she felt those guidelines were federal overreach, and that those policies should be a state issue, which caused the audience to erupt in boos. McSally also gave answers that were met with cheers from what appeared to be a largely opposition audience. She said she is firmly committed to defending Social Security and Medicare, and pointed to one of her early votes against a Republican budget that would have made cuts to those programs. On immigration, she said several times that the country needs to revamp its policy to make it easier for people to enter the U.S. legally. And while disagreeing with President Obama’s specific actions on children brought into the country illegally, known as Dreamers, she said she wants to work to fix the system “in the long run” so they can gain citizenship. On climate change, McSally said she believe the climate is changing and that humans have played a role in that. She also said new technology has decreased CO2 outputs over the past couple decades, including clean coal. The mood of the meeting was set early when McSally was asked to assess Trump’s first month in office, his cabinet appointments and policies. She called it “a tremendously bumpy rollout,” adding it was not well-coordinated and not well-implemented. She said Sen. John McCain’s characterization of Trump’s administrating being in disarray was probably too strong. However, she added, “it’s not my job to be a pundit,” and that she was in Congress to legislate and do her job. “He’s our president, what are we going to do about it?” McSally asked. “Impeach him!” the crowd roared back. McSally’s voting record so far shows her to be a march-in-lockstep, toe the party line Republican pretending to be a legislator. If re-elected, she will continue to be exactly that and nothing more. Nothing else to it, folks. But keep the heat on her. Expose the nothingness of these so called GOP representatives who can’t possibly be doing this for anything but the power and the perks and the advancement opportunities because they are not required to think or represent, just toe that line. Exposing them improves the chances they can be unseated in 2018. Liza, my cynical heart tells me you have just described 98% of the people, democrat, Republican, or whatever, running for office. Such egoists are NOT of a philanthropic nature. They are impressed with themselves and they like the idea of the power and perks that goes with the job. Have you ever noticed how many of these people show up in Congress of economically humble origins and leave Congress as millionaires? You don’t do that on a Congressman’s salary. Everyone looks the other way as they grow wealthy because, as they say, who watches the watchers? Will it? Really? Do you think the people who voted for her will change their votes because she is doing what they elected her to do? Do you think those who voted against her can vote against her any harder? “Exposing” her voting record only makes those who voted for her happier and those who voted against even madder. No net change. Steve, until voter turnout = 100 percent there are always more voters. People who were 16 and 17 years old in 2016 will be eligible in 2018. More of the older conservative voters will be dead. People who didn’t see the “fierce urgency of now” in 2016 might get off the couch in 2018. That’s how elections work. Things can change. That is true. But the ones that don’t vote rarely get motivated to vote, and they are pretty typical of the demographics in general: about 1/3 are liberal, 1/3 are conservative, and 1/3 are indifferent. Sadly, that group is traditionally the most unreliable group of voters there is. Lots of good intentions, but very poor follow through. True, but I doubt it will be enough to satisfy your needs. Again, true, but that can work both ways. I suspect that the crowds of screaming lefties that keep showing up on TV are turning a lot conservatives off. Some of them probably didn’t vote this time around because of Trump. But in 2018, Trump isn’t running. Or even better, he might have been impeached. In either event, it will encourage more moderate conservatives to vote in 2018. A note to the “conservatives” who post here. You’re supposed to be smarter than this. Why do they need to set up meetings to be ambushed by organized thugs who disrupt to provide false impressions to the media whores who slurp up this sewage? In five hours, they can get on the phone and talk to more people, real people not the paid thugs who you all turn out for these events. Oh, how we all long for the good ole’ days of 2009. A thug is a criminal, John. English is a great language. Learn to use it. When you don’t know the meaning of a word, look it up. Do not use words carelessly. Actually, Liza, Merriam-Websters dictionary (according to Google) defines a “Thug” as: “a brutal ruffian or assassin : a gangster, a tough”. Given the behavior of many of the liberal protestors at these so called town meetings, the word “thug” has applications. There is a group of what I would call “professional” protestors making the rounds here in Arizona at these meetings. If you look closely at the photos and videos you will see the same faces in several of them. Now, it can be argued that these are just very dedicated democrats trying to get the word out, but it is suspicious. I don’t know where they got their training, or if it is just a natural talent for boorish behavior, but it is most entertaining to watch, whether on TV or on-line. 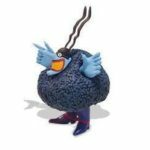 Watching someone get so excited spittle forms around their mouth, or someone trying to talk so loud and fast they lose the ability to form words, is absolutely hilarious. And the high-jinx of the ones dressed in costumes dancing around, the misspelled signs, the “clever” sayings whose meaning is lost in some obscure “liberal-speak”…it is gut busting funny watching them parade and jump around, each one playing to the camera like clowns. Fortunately, entertaining is all it is and it is not very influential. Odd, you just described every Tea Bagger rally, half the Trump supporters, Rudy Guliani and Alex Jones to a T.
Must be nice to be old and have selective memory loss. Now, along with owning everything Trump/Bannon/Putin are doing, you are the Official Party of Cowards. Even if that were true, Tom, (which it isn’t) we aren’t talking about them. I don’t see any of them raising hell because their representatives won’t hold Town Halls in order to allow them to raise hell, scream and have hissy fits. ”Now, along with owning everything Trump/Bannon/Putin are doing, you are the Official Party of Cowards. “Cowards”? I don’t think so. I think they are just exercising good common sense. Why bother meeting with people who didn’t support you in the past, don’t support you now, and won’t support you in the future? For a politician, that’s just a waste of time. Especially given the churlish and boorish behavior exhibited by these crowds of yahoos whose entire purpose is to raise hell and scream at the politician. Cowardice? No. That is just good common sense! > There is a group of what I would call “professional” protestors making the rounds here in Arizona at these meetings. Guilty as charged. I do go to a lot of demonstrations / events, and I have been down to County Administration plenty of times to speak my mind about various issues. Edward, not all the conservatives say people like you are getting paid. You are a true believer and would be willing to spend your own money and time to go places to protest. When I said “professional protesters” I wasn’t referring to them paid, I was talking about them making a full time project of going around to these protests out of a sense of dedication or for the fun or whatever of doing it. I don’t think Arizona is important enough to justify hiring people to protest. I do think that democrats are hiring union members to go around to these big protests and participate. It has been done in the past and I think it is being done now. But not here in Podunk, USA. All of these definitions of “thug” indicate violence and criminal behavior. That does not describe the people who are attending these meetings. Screaming, bitching, hollering, etc… at town hall meetings would not be considered thuggery by anyone using the word according to its meaning. One of the first things we could all do in an effort to get along is to stop making stuff up. Anyhow, it’s about time some of these march-in-lockstep GOP “representatives” got a fire lit under their useless rear ends. They need to be held accountable for every single march-in-lockstep vote. And if they are afraid to face their constituencies and consider doing so to be an “ambush”, then maybe they need to write their resignation and find another line of work where no one is mean to them. No one is in the mood to treat these people like they are royalty. They asked for this job, no they actually begged for it. Now what they need to do is get over themselves and meet with the people. If the people are “hostile” it is because they are angry and God knows they have good reason to be. And, like I said, those who are too frail to withstand opposition have other options. Wow! Thta response was quicker than I thought it would be! I agree, hold them accountable. As I said, people that voted for them will like the way they are voting and people that voted against them won’t. People that didn’t vote might be affected, but if they didn’t care before, I suspect they won’t care now. It would be nice them get them stirred up over something, though. “And if they are afraid to face their constituencies and consider doing so to be an “ambush”, then maybe they need to write their resignation and find another line of work where no one is mean to them. Or they can do what they are doing and ignore them. Nothing they can say or do (short of changing their votes on everything and going “left”) is going to make any difference to these yahoos. They know that there is a huge number of people that voted them into office that are in support of what they do. And I don’t think they are “afraid to face their constituencies”, I think they just don’t need the aggravation of putting up with vocal minority of people with an axe to grind. Especially when it is a pointless gesture. Actually, Liza, “the people” aren’t hostile. Just some of the of the people are hostile. A larger number of the people are quite happy with what they doing. That is one of the problems the left has: Despite all the evidence to the contrary, the left thinks it speaks “for the people” when it doesn’t. It only speaks for a portion of the people. I certainly know it doesn’t speak for me. Again, why? Putting aside the fact it is only a minority of the people raising a ruckus, why are they obligated to meet with them? I could see them wanting to meet with “the people” if it had any purpose, but it won’t. It will be a big scream fest and nothing more. Why waste their time? “And, like I said, those who are too frail to withstand opposition have other options. I don’t think they are too frail to withstand opposition. After all, they were elected and politics is pretty rough and tumble. I just think that they won’t meet with them because it would be a waste of time. Why meet with a bunch of loud, boorish chuckleheads who won’t give you a chance to speak anyway? Because they work for these people, supposedly. I realize that many of our so called representatives believe they serve only the major corporations and the wealthy. It’s high time they make some effort for these people or face the exposure they so deserve. That is what this work of representation is supposed to be about. Seems the GOP reps are all special little snowflakes who don’t like to be yelled at by all those big meanies they work for. As I keep asking, in what practical sense are these politicians obligated to “make some effort for these people” since these people likely did not vote for them? Why is it in the interest of the politician to cater to those who don’t support him? And does the “exposure they so deserve” represent any real threat to the politician? I don’t think so. The people who support the politician are delighted to see him putting these people in their place; the people angered by the politician’s actions wouldn’t support him anyway. You are correct. In theory. In reality things are different. Most politicians are pragmatic and they do those things that will get them re-elected. Catering to people who won’t support you and would like to kick you out of office is a waste of time. You cater to those who benefit you. It isn’t cowardice. It isn’t a fear of the people. It is just a hard, practical and pragmatic look ate the reality of life. Instead of hiding from their constituents they should just go golfing 6 times in one month like their thin skinned crybaby leader Little Donnie. The hypocrisy in the GOP is epic. You say “hiding”, I say “avoiding”. You say “their constituents”, I say “a screaming mob of yahoos”. Either way, not catering to them is the right thing to do. I am trying to understand where the “hypocrisy” is in your message. Did Trump say people shouldn’t play golf and then he goes and plays? Where is the hypocrisy? That statement should be posted on billboards throughout the nation. They keep forgetting we’ve got receipts. Or they don’t care, which is more likely. Steve, why do you pretend? Trump whined about Obama golfing non-stop while on the campaign trail, and the GOP/conservative media/Right wing AM hate radio constantly called Obama the “Golfer in Chief”. Now that your boy, and he is the product of your party and therefore your boy Don the Con has spent 20% of his time golfing, you suddenly don’t seem to care. And you go on about unhinged liberals covered in spittle but ignore the videos I posted of Teabaggers going nuclear. Go to youtube and search for tea party violence and enjoy any of the hundred thousand videos that pop up. The GOP is a hypocritical bunch of con men, or as I call them, people who are full of sh…. Do you really think there were many unhappy Republicans present, AzBM? When did Republicans start coming out in large number in protest with signs and cat calls? You know as well as I do that such activities are the balliwick of democrats. Trying to make it sound like there is universal condemnation of Trump won’t fly. One of the classic ploys of democrats is to coach children into being “spokesman” for their cause. Nothing quite like forcing children to grow up early and to cause them to worry about things that would normally be of little concern to them, eh? For some reason, democrats seem to find this profound and inspriring; I just find it disgusting. Another bit of proof that the audience was primarily, if not entirely, made up of leftists and democrats. Further proof of who was in the audience. And also the thing democrats and leftists REALLY want from Trump. Nothing short of impeachment is going to satisfy these screaming harpies, so Trump really has no reason to try and meet them half way…there is no “half way” point. Arizona’s representatives have been holding private meetings with supporters for years, they all need to start opening meetings to all the residents.